With the building containing small children, safety was of paramount importance so a system was required that met strict fire regulations, in addition to being able to work with the steel frame construction. PRS Group turned to Wetherby Building Systems to recommend an appropriate solution to meet the criteria and, as a result, its Epsicoat system was specified as the most effective product for the project. The Wetherby Epsicoat system installed comprised 200mm Mineral Wool insulation, to meet fire regulations and thermal performance requirements set out in the building regulations. The system was then finished with Wetherby silicone ‘K’ render in a mix of red, cream and grey shades to create a visually striking appearance. The exterior finish was originally specified as rain screen cladding, as this is the traditional finish used in the local area and would have been in keeping with neighbouring properties. However, the client wanted to create a contemporary, individual appearance for the building and so the architects designed the nursery with a render finish, in three different shades, to create stand out against a traditional street scene. 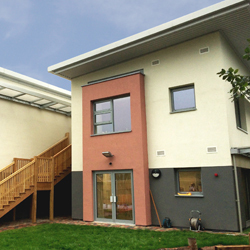 Commenting on the project, Colin Webster from PRS Group said: “The Epsicoat system used on this scheme has really given the nursery a stamp of individuality in an area that is dominated by rain screen cladding finished properties.